I missed such bright and cheery ramblings in my google reader, just waiting to spread a grin on my face. Welcome back! welcome back. missed you a bunch! Greets from Germany and my Jacky Pelle, who woold perfectly match for your little doggy. Oh My, she is sooooo adorable! Welcome home! I've missed you and your loveliness. Just pre-ordered your book. Can't wait to see it!! How wonderful to have you back!! I am look forward to reading all about your summer journeys! Great news on your book - I can't wait to read it! Welcome back!! I've missed you!!!!! Welcome home friend! 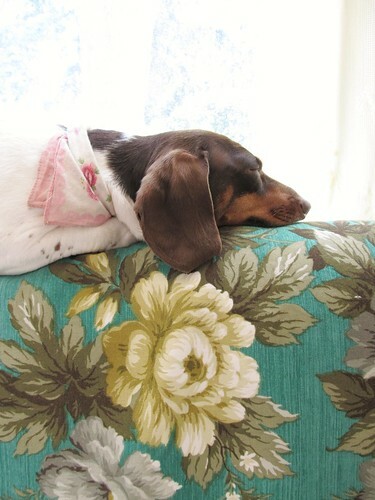 How nice to have you back, and might I say that little Olive's 'kerchief is the bees knees! Looking forward to 'postcards in retrospect'! Welcome back Tif! We've missed you, and can't wait to read your peachy book! Where can we order it in the UK? Welcome home Tif, I have missed you and your ramblings and pictures of Little Olive too. Welcome Home!! I am so happy you're back...oh, how I've missed your ramblings- they always bring a smile to my cheeks. thank you for the pre-orders, very spiffily of you all! Oh Tif finally....FINALLY....F-I-N-A-L-L-Y I click on your page to find a post....Oh how my eyes & heart missed your WONDERFUL ramblings....! I'm THRILLED to hear of course that you are back safe & sound but I'm sorry to say I am mostly motivated by selfishness....I'm sure I'm NOT your only HAPPY Reader guilty of THIS though....**wink**....!! Oh & I too have pre-ordered this much longed for tome....WOOHOO....Today is a WONDERFUL day....!!!!! bless your little heart welcome back! i happened by and there you were with that precious little olive! just pre-ordered your book and am not sure which i look forward to more...the book or the cooler fall weather!! welcome back! I have missed you Dottie Angel. Glad to see you are back to blogging again. You know how dogs sometimes sit at the window and look out longingly, waiting for the special human to return? I felt that way while you were gone. I kept checking in on the blog bookmark thinking, "Isn't she back yet? Sigh." Wag, wag, wag...you're home! Waiting now for tales from across the pond, and book. Well, I stumbled upon your site while surfing the net. 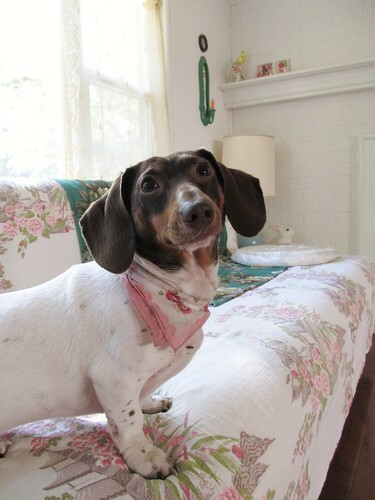 I fell in love with your site the minute I saw the doxie in the pictures!!!! I just have to follow your site now. How lovely to have you back! Missed ya!! Welcome back! I look forward to your postcards. Come to my blog for my giveaway! So good to have you back!! Love the "postcards in retrospect" idea. When I go on holiday, I write a postcard and post it home, so when I get home, it's there waiting with the stamp of that country/place. Congrats on your book, cannot wait to have a copy!! You were missed! Your pom making inspired me to join all of mine into a rug and my tippy toes are enjoying its softiness. I'm thinking my little Westie Violet needs a pom rug of her own too. :) I ordered your book today and can't wait to get soak in the lovely pages. Yeah !! ordering my book!! So glad you are back!! Hope you had a fun and thrilling good time!! looking forward to your future posts!! SOOO glad you're back, especially since I found you just as you were taking off on your summer adventure. I've been waiting anxiously for your return, much like your critters, I'm sure! thank you kindly for the welcome homes! I rarely write to you, but regularly visit your blog. And kind of miss your lovely piece for the past month. Nice to have you back. SO SO GLAD you are home....I have missed you! I HAVE TO KNOW what that wonderful fabric is and what it is on...a couch, a chair....oh my to die for...please do tell.